by Morris Dancers of England. The producers of this two DVD set - Stephen and Heather Newland - are most well known for their series of DVDs of the Morris Dancers of England, and this compilation of mummers' play performances represents a welcome diversification into new areas of the country's traditions. Both discs run for about an hour and ten minutes each. Disc 1 is split into three parts - an introduction to mummers' plays, performances of plays by five West Country groups, and a couple of interviews with performers. Disc 2 is less varied, as it specifically covers the play from Symondsbury, Dorset, again with an interview. The quality of the footage is generally good, although in some cases where it has been filmed in dark conditions it is rather grainy, or fogged when there are bright lights. Similarly, the sound quality is good, although sometimes the dialogue can be difficult to discern when the actors are walking away from the camera, or if there is background noise such as traffic. This may sound like a criticism, but folk play performances are notoriously difficult to photograph or film, and I think the Newlands have a better job than many. The first video on Disk 1 in effect summarises the whole collection, although it is intended as a narrated introduction to mummers' and guisers' plays. This is interwoven with clips of a tour by the Frome Valley Mummers, Dorset, which illustrates the basic plot of the play, as well aspects of organisation, costume and props. There clips from performances by the other groups on these discs, plus appearances from North Curry Mummers and Lodestone Morris. The summary of the origins and history of the plays is well researched and up to date, and is to be commended. Clips of interviews with numerous performers provide an excellent insight into how groups perform the plays today, and how they view them themselves. Frome Valley Morris Mummers are based in south Dorset, and perform a play in the run up to Christmas that originally came from Broadwey near Weymouth. They wear costumes based on Thomas Hardy's description of the mummers in 'The Return of the Native', characterised by semicircular hats with streamers obscuring the face. Rather impressively (and worryingly), Beelzebub enters with a big flame burning in his frying pan. The Marshfield Mummers from Gloucestershire also known as the Paper Boys were famously revived in 1932 following an encounter between the folklorist Violet Alford and the vicar's gardener. Their Boxing Day performances will already be well known to many. Their alternative name comes from their costumes, which are made up from strips of newspaper, in some cases very old newspapers. The Wessex Morris Men perform their play in and around Cerne Abbas, Dorset, and unlike Frome Valley and Marshfield, the mummers dress according the parts they play. They achieved their 15 minutes of fame in 2002 when Dorset County Council prevented them from performing inside the Red Lion following a public complaint because they would have breached the licensing laws. (They performed in the road instead.) This became a national cause célèbre, and was one of the factors that led to morris dancers (but, ironically, not mummers) being exempted from the Licensing Act 2003. Babylon mummers, from Dorset, also dress in part, but most of them blacken their faces by way of disguise. This no doubt has something to do with them normally being a border morris dancing side; as such dancers normally blacken their faces. This performance was recorded in Beaminster at New Year. Finally, we see the Dartington Morris mummers, Devon, filmed in Totnes. They also dress in part, but use metal swords, unlike the other groups, who use wooden sword. These swords make an impressive clash, but the fights must require careful choreographing. The last section of Disc 1 comprises interviews with Doug Bond, town crier with the Marshfield Mummers and Steve Cunio of Babylon. Doug mostly talks about the history of the Marshfield play, while Steve talks about how Babylon put together their play, turnover of the cast, rehearsals and where they tour. They have recently started performing on Saint George's Day (usually without Father Christmas). 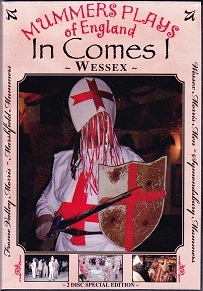 As already stated, Disk 2 is devoted to the Symondsbury Mummers play performed at New Year. This is an unusually long play, lasting over half an hour, which makes it three or more times as long as the other plays. In fact it is given here twice, once in on piece, and later split into four 'scenes'. This is not an unwelcome approach for such a long play. The scenes are headed: 'Saint George', 'Dame Dorothy', 'The Pony', and 'Singing the Travels'. 'Saint George' on its own would be a normal mummers' play, if somewhat embellished. The costumes are mostly smart white uniforms with coloured sashes and streamer covered conical hats. Saint George fights in turn with Captain Bluster, Gracious King, General Valentine, and Colonel Spring, after which, as usual, the Doctor is brought in to cure them. 'Dame Dorothy' is a domestic argument between the Dame and her husband Jan over a old Jack Hare that results in Dorothy being knocked down. Once again the Doctor is called, with much comedy. 'The Pony' is a mast-style horse, similar to those found in Cheshire Souling plays, but with a wooden head. Dame Dorothy mounts the pony, and after an unsuccessful mounting attempt, the pony is knocked down by Jan. After being raised up by the rest of the cast, the pony sets about picking people from the crowd alleged to be guilty of various minor misdemeanours. 'Singing the Travels' is the finale in which the whole cast reassembles to sing the concluding song - version of dialogue ballad 'The Husbandman and the Serving Man'. The Symondsbury interview is with David Warren, who plays the Doctor. This plays is the oldest in the collection, having first been collected in the 1870s or 1880s. Like other many traditions it lapsed around the time of World War, but was revived about 1928. He explains how they arrange their performances for the Christmas period. The costumes may be inherited from previous actors, but they are replaced as an when required but to no set pattern or design. All in all, this is a useful and informative collection of folk play performances, giving viewers plenty of scope to compare and contrast the various groups' approaches to the tradition. There are none of the out of date ideas or speculative assertions that have sometimes marred other similar productions. I have no hesitation in recommending it. The plays on these discs are all hero-combat plays from a relatively confined area of southern England, and share a number of common features - such as the presence of Father Christmas and the Turkish Knight - that are typical of the region. The title of the DVD reads as if it is meant to be the first of a series, as the Newlands have already done with morris dancing. If so, it would be good to see compilations of plays from the Midlands and northern England, including Pace-Egging plays, Souling Plays, and Plough Plays. This collection took several years to film, because of obvious logistical issues. Additional compilations may therefore take a while to appear.